Samsung Galaxy A10 With Exynos 7885 and 2 GB RAM Visits Geekbench - Playfuldroid! Samsung is aiming the new Galaxy A-series of phones towards the Chinese markets to resurrect the brand in China. Recent reports have revealed that Samsung is working on Galaxy A10 through Galaxy A90 phones. Among these phones, some of them have already appeared on Geekbench with key specs. 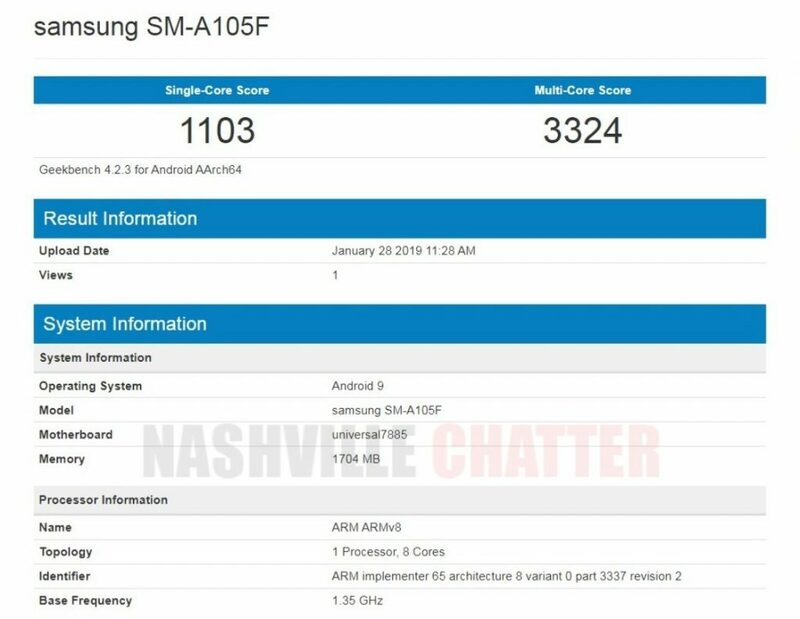 Today, the Galaxy A10 with a model number of SM-A105F has paid visit to Geekbench benchmarking platform to reveal some of its specifications. The Galaxy A10 Geekbench listing reveals that it is powered by the Exynos 7885 chipset. Recent reports have revealed that the same processor will be powering the forthcoming Galaxy A20, Galaxy A30 and Galaxy A40 smartphones. The Galaxy A10 seems to be the weakest among the forthcoming Galaxy A phones since it features only 2 GB of RAM. The device is running on the latest Android 9 Pie OS. In the single-core test of Geekbench, the Galaxy A10 has scored 1103 and in the multi-core test, it has scored 3324 points. A recent report had claimed that the Galaxy A10 could be one of the first Galaxy-A series phone to go official. The device is expected to come equipped with an LCD panel. However, there is no confirmation on whether it will be featuring Infinity-V or Infinity-U display design.